At the end of “A Necessary Bond,” I was left wondering exactly which bond was necessary. The one between the Jedi and their lightsabers? Hondo and Katooni? Good dialogue and bad dialogue? The final episode in the Young Jedi arc is a mixed bag. It contains some fantastic character moments for female characters and the cast in general, but also has some corny dialogue and ultimately fails to wrap up the moral storyline presented in the first episode of the arc. A lot of female heroes shine in this episode. One is Ganodi, who proudly declares “We rescued you!” to Ahsoka. (If there were a Bechdel Test equivalent for when two aliens talk about something other than a human, this episode passes that, too. I declare it the Crouse Test.) Ganodi even holds the weight of most of her classmates – literally – while Petro steers their stolen vehicle. Ahsoka gets her fair share of heroic moments, and heroic music, too. In a particularly visually appealing scene, she jumps across the whole screen with a wide sky as her backdrop. Ahsoka’s gender is not important to the deal she makes with the pirates. The sardonic negotiations reminded me of something Anakin or Obi-Wan would do. The final battle pits Ahsoka against Grievous, again putting her in the role of the Master who sacrifices her own safety for others. She uses her speed and maneuverability against Grievous’ pinwheeling arms and tries to stay away from them as much as possible until she can come in with a strong counterattack. 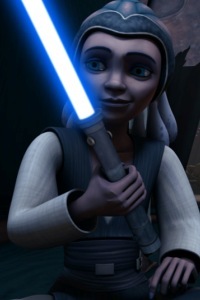 Katooni, the little Tholothian, becomes a focus when she initially doesn’t have a lightsaber to present to Hondo. 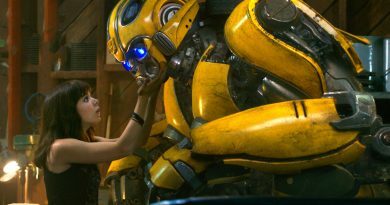 The fact that she builds it right in front of him is a bit convenient – all she needed was pep talks from Hondo and Huyang – but it was inspiring that she did. Katooni also has to make a choice in this episode. In a few lines of dialogue and significant glances during the speeder chase scene it’s established that she’s started to respect Hondo for how he helped her, and she’s tempted away from the Jedi in an entirely different way from Anakin. But she also illustrates to kids that even though Hondo helped out a little, it still isn’t wise to go with a drink-quaffing pirate instead of your friends and teachers. Hondo and Katooni are interesting together for two reasons: the clash of ideology and age difference, and the fact that their relationship is more about them as individuals than about factions. We see that Katooni is tempted away from the Jedi and that Hondo admires the little girl for putting together her lightsaber under pressure. If these two hung out more, it could be one of the few character-driven pairs in the series – people who weren’t put together by a common love of money, an epic mission, or the Republic. It’s just so wonderfully odd to think of a Jedi having a pirate as a mentor. I bet she’ll be regretting not going with him around the time of Order 66. The ability to frame a coherent theme for an arc, and sometimes even within a single episode, has been consistently missing from The Clone Wars. Many cartoons such as Gravity Falls or Avatar: The Last Airbender establish a moral problem as well as a physical challenge at the beginning of the episode and tie both together by the end. It baffles me a little that The Clone Wars struggles so much with this. Sometimes it looks like they try, but fail to get the two parts to cohere. Structuring the arcs like a movie instead of an episodic television show sounds good in principle, but in practice it makes the episodes feel like they haven’t accomplished anything. I’m still not sure which bonds are necessary.